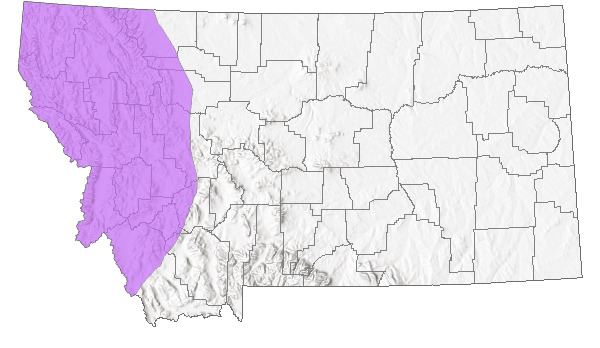 Rare in Montana, where it is currently documented from over a dozen fens and wet meadows in the mountainous portion of western Montana. CommentTrends unknown, though populations are likely stable or experiencing only minor declines. Score 5 to 8 total points scored out of a possible 19. Plants forming large hemispheric tussocks. Stems terete, 10–40 cm, densely clustered. Leaf blades reduced to scales at the base, often with 1 short blade on the lower stem, 1 mm or less wide. Spikelet 3–6 mm long with 2 to 4 flowers; awn of lowest bract barely longer than the spikelet. Scales 3–4 mm long, glabrous, brown, apiculate. Flowers: bristles 6, brown, barely exceeding the scale awn. Achene ca. 1.5 mm long (Lesica 2012. Manual of Montana Vascular Plants. BRIT Press. Fort Worth, TX). Trichophorum cespitosum could easily be mistaken for a species of Eleocharis; however, the former has spikelets subtended by a short-awned scale, whereas the latter do not. It resembles T. alpinum except for its smooth, round stems, and resembles T. pumilum except that it forms large, distinctive tussocks and has perianth bristles. Circumboreal south to OR, ID, UT and MT (Lesica 2012. Manual of Montana Vascular Plants. BRIT Press. Fort Worth, TX). 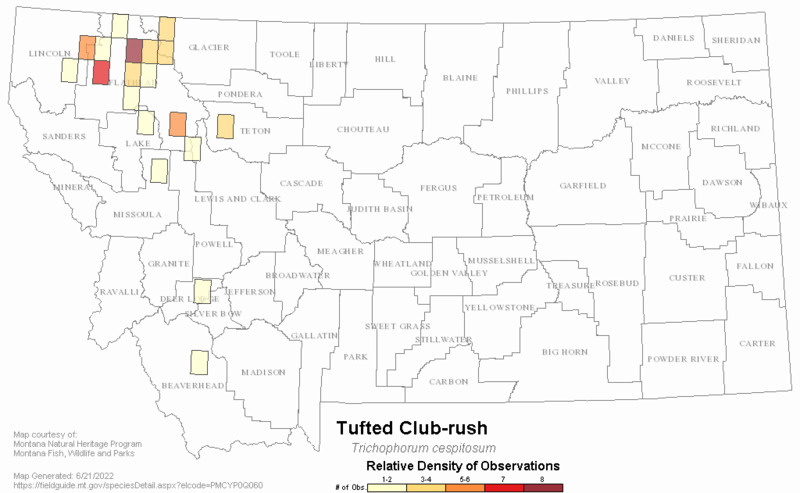 Wet meadows and sphagnum-dominated fens in the montane to alpine zones. Lesica, P. 1991. The Rare Vascular Plants of Pine Butte Swamp Preserve. Unpublished Report to the Nature Conservancy. 15 Pp. 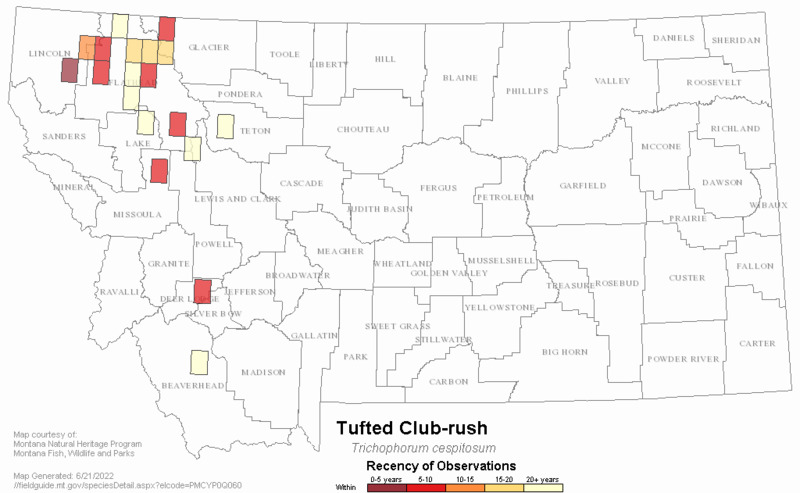 Web Search Engines for Articles on "Tufted Club-rush"